Hear thee, orcslayers! Let's check out another goodie from the pile of new features. This time around it will have to do more with how the dungeons are generated. During playthroughs I noticed that the dungeons get pretty dull quickly as they really lack variety. It's usually just one room after another, always with 1-2 guys tops, unless a rare monster spawns with his bodyguards. A couple of versions ago I implemented a room system which allows me to spawn each room with specific logic and for a while I wanted to implemented "themed" rooms to add some variety. 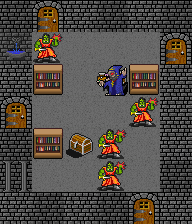 The rooms will be of three kinds: Granary (a food chest), Armory (with an equipment chest having magical and rare items) and Library (with a chest containing potions and scrolls). Libraries will try to mostly contain mages, Armories will attempt warriors, while Granaries... well, whoever was hungry at a given moment! 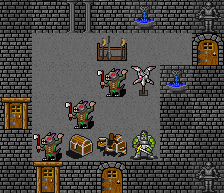 There are some exceptions though, as I don't want to have kobold shamans on 1st level of Pinefell dungeon to kill the player outright, so these rooms might stray from those spawn patterns in such cases. These rooms will spawn with either a rare creature and a couple of bodyguards, or with a larger pack of enemies, which also means that AOE attacks might come in handy. I do have a couple of ideas on how to get these dungeons more interesting to explore, but I would really love to hear some of your suggestions! Is there something you would like to encounter in there? Or something you would totally not want to encounter, but it would still be fun to die from it? 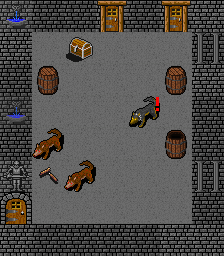 And yes, those are wargs within the granary room in the screenshot. And no, they weren't munching on orcish nuts. They know better.